A GFCI (ground fault circuit interrupter) outlet works by shutting off a circuit in the case of electrical current flowing along an unintentional route which prevents electric shock and fire. GFCI outlets are required in the kitchen, bathrooms, and garage of your home. 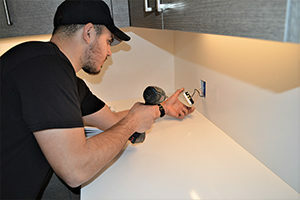 At Brilliant Electric we can replace, repair, install, rewire, and troubleshoot your GFCI outlet! Can I troubleshoot my own GFCI? There are a few easy steps you can take to see if your GFCI needs attention from a certified electrician. 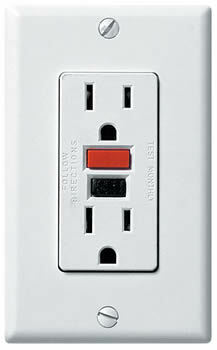 Press the “TEST” button on your GFCI outlet to trip your “RESET” button. Pushing “RESET” should reactivate the power in your outlet. If pushing the “TEST” button does not trip the “RESET” button, you may be lacking power. Check the power in the room — you may have a tripped breaker in your electric service panel. If you have power to the room, you may have a bad GFCI. If your “TEST” button is operating but your “RESET” button trips immediately after pushing it, you may have a serious current leak on the circuit. The problems listed above can be serious and require a professional to troubleshoot further! Avoid risky DIY fixes and call Brilliant Electric to troubleshoot your GFCI.